Practical Information for San Felipenses. Whether you are looking for the most refreshing drink on a sweltering day (jamaica) or a way to prevent the neighbors' dogs from dropping their ordnance in your yard (sprinkle pepper powder on the ground), practical information is invaluable. Life in a desert puts a different spin on what people may consider practical. Instead of looking for ways to remove stains from a carpet (with the prevalence of sand and burr-sage, few desert-dwellers here are silly enough to carpet their homes), it's more common to see someone looking for the correct tire profile for driving their VW on the beach. Or trying to find a way to prevent jackrabbits from eating their plants. San Felipe offers nearly all the amenities and services of a larger city. So there isn't a lot of difference in the things people need to know to overcome a small crisis. 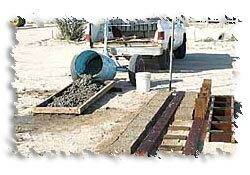 An alternative to cement blocks. But those who live away from town, in desert communities, with no local water supply or electrical service, have to develop more exotic skills. They often find themselves in need of information that isn't normally found in the average reference book. Whether they fall back on their own ingenuity, take recourse in local, time-worn solutions or dig through bookstores and libraries for their answers, their problems often yield to unusual and creative remedies, well worth mentioning here. What you can take into the country..
How far does the tide go out? Lost or Stolen Credit Cards? Don't buy a car from a mule!